I suppose I should report on the activities I mentioned in last week's sampler. Phil Keaggy was fun: the first set was a complete – and, I'm told, "verbatim" – rendition of the 1978 instrumental album The Master and the Musician. I'm neither an audiophile nor a musician, but I liked Keaggy's guitar and especially liked the band behind him. The second set included a little too much Christian pop for my taste. U23D was great, but we all thought it was too short. And we wished the folks running the IMAX theater would have turned the sound up. (Way up. It's rock and roll.) But that just means we loved it. "Streets" was a high point, and the transition from "Love and Peace or Else" to "Sunday Bloody Sunday" (via Bono on a solo drum) was vintage U2 melodrama. I knew much more then than I do now. – U2, "City of Blinding Lights"
I don’t know as much as I used to. Howard's remark, part of his response to an incoherently rambling "comment" from the audience after his lecture, drew significant applause. My post will include his extensive outline along with my impressions, and I'm told that audio and/or video will be posted on the Grand Dialogue site at some point. 1. In a past Journal Club, I described work by Joe Thornton's group in which they "resurrected" ancient proteins and examined their properties, thereby assembling an evolutionary history of steroid receptors. Ian Musgrave at Panda's Thumb reviews a recent report that employs a similar strategy, looking much deeper into life's history. 2. Steve Martin at An Evangelical Dialogue on Evolution posts some typically thoughtful and informed reflections on Tony Campolo's Darwin/Hitler piece last month. He doesn't say what he thought of the exchange I had with David Opderbeck in the comments after my own post on the topic. I'm curious. 4. Tuesday was Darwin Day, on the occasion of his 199th birthday. How did I celebrate? I think I spent much of that day working with cells and wrestling with DNA sequence analysis, but hey, every day is Darwin Day. :-) Last week's issue of Nature includes a somewhat more substantive tribute, an article by Kevin Padian, "Darwin's enduring legacy," in which he "looks forward to a season of celebration by outlining how Darwin’s ideas changed scientific thinking." 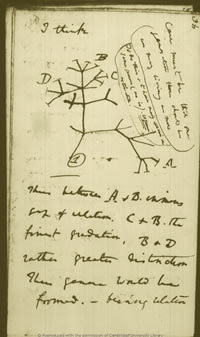 The article touches on 10 topics that "hint at the magnitude of the man's legacy," and it's worth the trouble to get a copy if you're looking for an overview of the big ideas that are legitimately attached to Darwin's name. But what did he mean by ‘gradual’? Most dictionary definitions have it as ‘slow and steady’, and this is indeed one meaning that Darwin used. There is another. This conceptual tension between ‘slow and steady’ and ‘step-like’ is the basis of one of the most important evolutionary ideas of the twentieth century: punctuated equilibria. This generalization is based on myriad fossil examples showing that the morphology of species may not change appreciably for much or most of their history, then alter relatively rapidly. If this turns out to be the predominant pattern of evolution in well-preserved fossil sequences, as now seems to be the case, Darwin’s view of the plurality of evolutionary tempos and modes will be vindicated. Punk eek as Darwin's idea? I like it. 5. Just announced: the 2008 schedule for the Michigan Shakespeare Festival. All's Well That Ends Well and Julius Caesar. All's Well will be a new one for me. We're talking about a family vacation in Jackson. No joke!